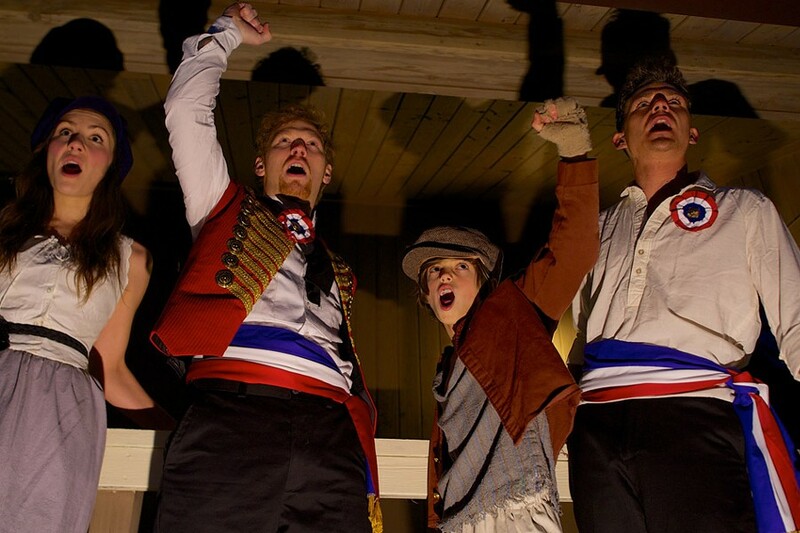 Photo by Joey Campagna, Blue Swan Media Emily Putnam as Eponine; Jimmy Baroom as Marius, Jonas Campagna as Gavroche; and J. Daniel Lauritzon as Enjolras in Pittsford Musicals' "Les Miserables." After sitting through a disappointing 2012 film adaptation and the lackluster 25th anniversary touring production that made a stop at the Auditorium Center back in May, I admit that, despite my fondness for the show, I wasn't quite sure I was ready to subject myself to yet another staging of "Les Misérables." Thankfully, I decided to disregard my hesitancy, as Pittsford Musicals' exceptional new production of the wildly popular musical served as a heartening reminder about why I ever liked the show in the first place. Credit goes to an exceptionally talented cast and resourceful staging that places an emphasis on the heightened emotions behind the tale of love, hardship, and rebellion rather than the overblown spectacle you might be used to seeing. If you're bothering to read this review, it's probably safe to assume that you know the plot to "Les Misérables" like the back of your hand. But what the hell? Let's recap it anyway. Based on Victor Hugo's 1862 novel of the same name, the musical follows the plight of prisoner Jean Valjean, jailed for stealing a loaf of bread to feed his sister's starving child. After 19 years in prison, he is released on parole, only to break it when his criminal past makes it impossible to find work. Despite constant pursuit from Javert, a policeman with an uncomfortably one-track mind, Valjean eventually claws his way up from nothing, managing to become mayor and a wealthy factory owner. When he inadvertently gets one of his workers fired, he makes a promise to the dying woman that he will raise her young daughter, Cosette, as his own. We then flash forward nine years as Cosette, now a young woman, falls in love with an idealistic young revolutionary named Marius. As their love story plays out against the backdrop of the Paris Uprising, eventually there's a happy ending for the lucky few who manage to survive the tale. Epic in just about every sense, "Les Misérables" is an ambitious undertaking for any community-theater group, even one with as sterling a reputation as Pittsford Musicals. Faced with the task of coming up with ways to engage new audiences in all the story's melodrama, the response from most directors seems to be doubling down on spectacle. Tom Hooper's lavish film adaptation expanded the world with a misguided focus on the grimy realism of 19th century France, while the overproduced anniversary tour added background projections and even more elaborate sets. Lacking the budget of either of those productions, Pittsford Musicals Artistic Director Mike Pincelli was more or less required to simplify the more technical aspects of the show. Scaling back the production, and dialing down the bombast, has done wonders for the show, and the result is invigorating to watch. While retaining the story's scope, the smaller scale makes for an experience that feels more intimate, making it easier to get invested in the story and uncover the real emotions underneath. Particularly impressive is the utilization of simplified, but remarkably effective, sets designed by David Fisher to accommodate the relatively small stage of Pittsford Sutherland High School. Chris Streeter is also quite good as the self-righteous inspector Javert. His strong voice is used to great effect during "Stars," Javert's big moment to shine, and he nails the character's significant rage that lies hidden under the stoic exterior. JCC CenterStage veteran Laura Jean Diekmann makes a lasting impression as the short-lived Fantine, and Emily Putnam gives an incredibly moving performance as the tragically lovesick Éponine. Mark Smillie and Dresden Engle prove to be an excellent team, turning in suitably hammy, scene-stealing performances as Master and Madame Thénardier. The love story between Marius and Cosette is always the least engaging part of any production of "Les Mis," so a special mention must be given to Jimmy Boorum, who besides having a stellar voice, is able to take the traditionally dull character of Marius and actually invest him with a bit of life. With its production of "Les Misérables," Pittsford Musicals proves that you don't need a Broadway-sized budget to deliver Broadway-caliber theater. A committed, passionate, and skilled cast and crew is better than all the razzle dazzle money can buy.